The IBS Audio Program- The Best Hypnosis Program Available for IBS! What is the IBS Audio Program 100? The IBS Audio hypnosis program is a 100-day medical grade hypnotherapy program which takes you through progressive, calming meditations and guided imagery to help calm your gut and soothe anxieties and fears related to IBS. The program was developed by Michael Mahoney, a leading hypnotherapist from the UK who has had tremendous success helping IBS patients. Many doctors have referred IBS patients to Michael after countless other pharmacological treatments have failed. Current research has shown that IBS definitely is not “all in your head”, but there is a really important psychological component to the illness that most people fail to address. On the mental health side of things, this program is the best tool out there which will allow you to calm your gut and body overall, allowing it to heal. What’s Included in The Audio Program? The IBS Audio Program 100™ is structured over a 100 day period, with a listening schedule for each day (including 20 days off). It contains an introduction and five different interlinking hypnotherapy sessions, each building on the preceding one. Sessions vary in duration but average 25-35 minutes. The program also includes a progress log, symptom checklist, and valuable IBS information. All that is required for participation is to find a time each day when you can listen quietly and be undisturbed. Simply fit your listening time into your daily schedule at your own convenience. The foundation session. Allows listeners to take the time to reduce their stresses and apprehensions, and to become familiar with the hypnotherapy process, and to re-learn that they are in control at all times. Offers a gentle introduction to reduce anxieties and emphasize calming thoughts, thus reducing the negative thought patterns which trigger IBS physical responses. Helps manage IBS symptoms and let users begin to understand the benefits of allowing both mind and body to work together towards their goal. Begins to address the subconscious and conscious thoughts which can trigger IBS symptoms. Teaches users, through creative imagery, to exercise control over these thoughts. Uses the power of suggestion to enable listeners to learn to control the speed of peristaltic waves of the GI tract, leading to normal bowel movements. Uses the mind to regulate the body. Uses visualization to control the entire digestive process, from start to finish. Begins to allow the user to take control and mentally search for areas within the GI tract where there is IBS pain or discomfort, and then reduce these symptoms while continuing to use positive thoughts. Negative thoughts decreasing and are replaced by positive thoughts, which will help develop new coping strategies. Uses metaphor to help view the journey through IBS as a trip that is nearing an end. Acknowledges struggles of the past, the many steps the journey has required, and that while there may be a step back occasionally the progression forward will remain. Acknowledges old thought patterns and allows them to be released; enhances positive thought patterns to achieve continuous improvement. Emphasizes that while memories of old thought patterns may remain, we don’t live in the past. We live in the moment. From this moment on IBS will steadily improve, a sense of order has been reached, and progress will now continue on its own. Encapsulates positive moments from the five previous sections of the program. Reaffirms the effects of the program. Listeners are encouraged to review this session occasionally after the program ends to optimize their positive changes. Content and listening order of the sessions are both important. 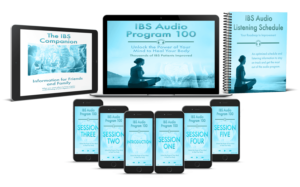 The IBS Audio Program 100 gives the IBS sufferer the structure necessary to allow a progression to the ending of many of presenting IBS symptoms in their lives. After the program is concluded, patients are encouraged to listen to the final session for an additional period of time to ensure the learned processes are embedded into their subconscious. The program is successful for the majority of users in reducing or even eliminating the presenting symptoms altogether and often also leads to a reduction in the severity of presenting. An additional audio session for friends and family. This audio helps people without IBS or digestive issues to understand what the sufferer goes through on a day-to-day basis. Helps friends and family understand the IBS struggles so that they can help and provide guidance and encouragement when needed. Structured and optimized listening schedule allowing the program to work effectively. Allows the user to stay on track and get the most benefit from the hypnotherapy program over the 100 day period. Not sure if this product will help? Try the first session for free! We are pleased to give you some feedback. Alan is much happier playing now too, and he often speaks about you and your work together. We see this as very positive as he simply sees that time in his life as a happy one, and not as one of continuing distress. He has even decided he is going to be a doctor when he grows up, this makes a change from a footballer, or millionaire which was his previous flavours. Whatever Alan grows to be, we know it wouldn’t have been possible without you. We are so pleased we heard about your hypnotherapy sessions. What To Expect From Using The Audio Program? The great thing about the IBS audio program is that is it cost-effective, immediate, and proven over many years! Is this program a download or CD's? We have partnered with Michael Mahoney’s company Healthy Audio to provide you with the immediate download hypnotherapy sessions. This means that the product is a digital download and does not include physical CD’s. By using a digital download you will have access to the product immediately and be able to listen to the sessions from anywhere you please. Just remember hypnotic recordings should not be listened to while driving or operating anything. They are extremely calming, soothing, and healing sessions which require total relaxation. How is this program different from Healthy Audio's version? We have partnered with Michael Mahoney and his company Healthy Audio which also sells the IBS Audio Program. The reason this program is different is that SIBO Survivor has specifically updated the materials in this program to make the learning structure easier to understand and the content relevant to SIBO patients. How will this help with SIBO since SIBO is bacterial overgrowth? Good question. Yes, SIBO stands for small intestine bacterial overgrowth which is when there is too much bacteria in the small intestine. Remember, 60-80% of people with IBS have SIBO. While research has shown SIBO can be caused from food poisoning and a reduction in gut motility due to nerve damage, often time this condition is much trickier to treat than taking a course of antibiotics. Usually people with chronic SIBO or IBS have been dealing with the digestive illness for a period of time and the stresses, anxiety, and emotional aspects of the condition are not addressed. It has been shown that stress and anxiety do contribute to altered gut motility and thus play a role in the root of healing. By addressing and correcting the emotional aspects of IBS and SIBO using this audio program you will learn how to calm your gut and improve digestive function and motility which is a main factor that can contribute to SIBO. It’s important to remember that SIBO occurs because of impaired gut function which is why in order to heal you need to work on other contributing factors. This is why fixing your mind-body connection can help SIBO. How does Hypnotherapy Treatment work? It can be difficult to understand how listening to words, descriptive imagery, ambient music and suggestions can make your body function differently, and how they can lift your mood, perceptions, outlook, and bring better understanding. Imagine this response like a flow of dominos, you have the thought, the dominos begin to fall, and the physical/ emotional response is complete when the last domino falls. The process is complicated, but hypnotherapy opens the door to the subconscious mind, and aids the change, or instigates positive change where it is needed. The IBS 100 audio program is best for anyone who has been diagnosed with IBS or SIBO and experiences anxiety, stress, and worries in day to day life. IBS and SIBO can be a chronic condition that wears on your mental and emotional state. This audio program is especially helpful for people who need to improve the mind-body connection which is causing a lot of anxiety and burnout. How can simply listening to someone talking be useful? This program helps you to understand the mind and body connection, how every thought, whether it is conscious or subconscious, creates a physical response. You, like many thousands before you, can hear how to speed up or slow down your digestive system. You can understand how to reduce pain differently, how to reduce it and control it. Using simple yet effective imagery and suggestion you can take part in your own healing. A structured suggested listening schedule is provided to optimise your listening experience. Will the audio program work for me? This is difficult to answer because we are all different. As with anything, you must take part in the process. The fact that you are here and reading this shows you are looking for answers and you are proactive in the care of your well-being. If the sessions are listened to as suggested, you have a very good likelihood of seeing the results you desire, just as very many people who have used the program successfully have reported. But, of course, you have to put in the time to listen, make this a part of your routine, follow the schedules too, and as they say, you have to be in it to win it – simply if you don’t try it, you will never know. The program has helped many people with IBS and SIBO. Even those who have failed many other treatments. It has stood the test of time with an 18-year track record and has been used around the world. It was created by the UK’s leading clinical hypnotherapist, researcher, and program developer who understand the illness. This program can really help. If for some reason it doesn’t we promise to refund every cent. Get the IBS Audio Program Today! READY FOR CALMING, SOOTHING, AND LASTING RELIEF?